Q: How do you ensure that you look after your health and wellbeing? Gok: "My history with my weight and my eating disorders is very public, but now I’m all about having a healthy lifestyle. It’s about realising that the stuff I put into my body is going to determine how I feel about myself either later on that day or the following day. I love a gin and tonic but I know if I have too many then I’m going to feel rotten. I try to have moderation in my life." Q: What sort of foods do you eat regularly? Gok: "I eat about 80% Asian food as that’s what my body is used to digesting. I don’t tend to eat processed foods and I don’t eat a lot of meat, although I’m not a strict vegetarian. I eat a lot of fish, rice, noodles and plenty of fresh vegetables. I also have a pot of Activia every day as it helps me feel good from within. My favourite flavour is Fig. I do tend to eat quite healthily. Sometimes I have really healthy days where I just go a bit bonkers and I’ll have a smoothie in the morning, then I’ll take my vitamins, and I’ll have a salad for lunch, then steamed veg and brown rice in the evening. But other days if I fancy a plate of chips then I’ll have it. I don’t deny myself treats." Q: Do you do much exercise? Gok: "I used to be a real gym bunny, working out about four times a week, until I hurt my back last year. Since then I’ve had to be very careful not to injure it again. My job is very physical and I’m constantly rushing around so I get a lot of exercise that way. Also, having my dog, Dolly, and running around after her all the time, is just like going to the gym every day! She’s 18 months old and she’s the most active dog in the world. She’s really helped in my rehabilitation from my back injury." Q: Do you take any supplements to support your health? Gok: "I take lysine because I get cold sores and it’s really good for that. I also take vitamin D to prevent the winter blues. It’s also good for the hair, nails and teeth. I also take a standard men’s multivitamin and every now and again I’ll have fish oils, zinc and magnesium. There was one stage where I took so many vitamins that it took me 20 minutes to get out of the house! But I’ve since reduced it down and now I try to get most of my nutrients from the food I eat." Q: Have you tried any complementary therapies? Gok: "Yes I’ve tried all of them. I didn’t like reiki very much though as it made me feel ill. When I was doing How to Look Good Naked we tried out lots of therapies and beauty treatments. But I’m not very good with things like having a massage because I end up talking the whole way through so it’s not very relaxing!" Q: So how do you relax then? Gok: "I draw, which I really enjoy doing. I also love cooking as it really helps to chill me out if I’m feeling stressed. It gives me time to think. A lot of my time is spent talking or interacting with people so sometimes it’s good to just go off for a walk and have a bit of time to myself. London is a big old concrete jungle but I have certain places I like to go off to and find a bit of serenity. You find your own little haven. I don’t spend too much time alone though as I’m not very good at it. I come from a really noisy family where we always had visitors in the house so I’d really struggle to spend a whole weekend on my own." Q: You’re currently working with Activia on their Feel Good From Within campaign. Can you tell us a bit more about that? Gok: "It’s all about making sure that you look after yourself and follow a healthy lifestyle. If you work hard and play hard then you need to take care of your health as well. It’s very similar to my old job which was all about making people feel better about themselves. It’s not about spending money and having huge cars and houses or dream holidays, it’s more about the things you do every day. It’s about making sure you see your girlfriends, spend time with your family and really look after yourself." Q: So what things make you feel good from within? 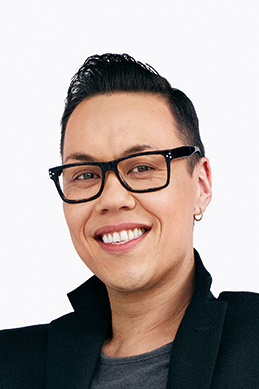 Gok: "My family are very important to me – we’re very close and speak to each other on the phone most days – so spending time with them makes me feel good. Cooking for friends and having people round makes me feel good too. I also love taking the dog for long walks. I never used to be like this! I used to be out in Soho four nights a week but now I’ve got old! My job also makes me feel good. I really, really enjoy what I’m doing and I get a lot of pleasure from my nine to five, which is quite unusual for a lot of people. Every day I go to work and I have to pinch myself and say: 'Is this really a job?'"